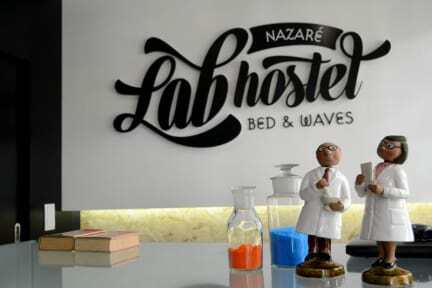 Lab Hostel Nazaré i Nazare, Portugal: Reservér nu! Our Hostel has 3 rooms with 6 bed (mixed, female and male) and private toilets and shower, 2 family rooms (up to 4 people) and 1 double/twin room all with private toilets, with shower and heating. Wi-Fi coverage on the whole building. It also has a breakfast room and a living-room with TV and games. LabHostel is in Nazare's historical center, just 1 minute away from the beach and the main plaza, the center of nightlife and restaurants.The area is famous for its beautiful beaches, ideal for practicing water sports like surfing and body-boarding. The most famous is the North Beach, known for its giant waves . The city has a water park , museums and forest areas with pedestrian crossings and possibility of pick- nick Near the LabHostel you can find shops, supermarkets, restaurants and a pharmacy. The dorms lacked space for hanging towels etc. as the hostel request you not to have any baggage other than in the lockers. Sufficiently close to city center and walkway to the old part of town.